Most artists have their own unique style when it comes to their work. For Louis De Guzman, he blends together images and stories in his signature geometric abstraction style. Born and raised in Chicago, Illinois, Louis was recently in Manila to present ‘In Between The Lines’, his third collection of work, and his first consisting of completely original pieces. The exhibit presents artwork that reimagines the grey area and serves as a visual metaphor about his journey. 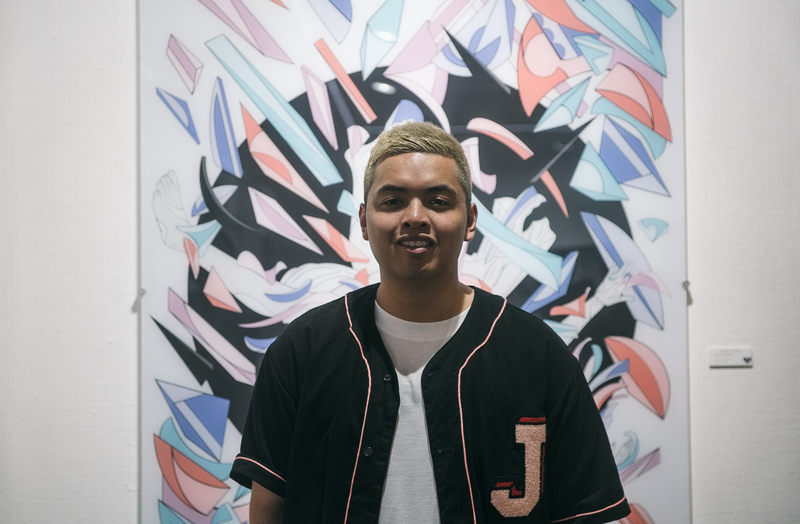 We met up with the Filipino artist during the launch of his first solo exhibit at the Secret Fresh Gallery to talk about Chicago, his journey, and his heritage. Welcome to Manila. Could you please introduce yourself? 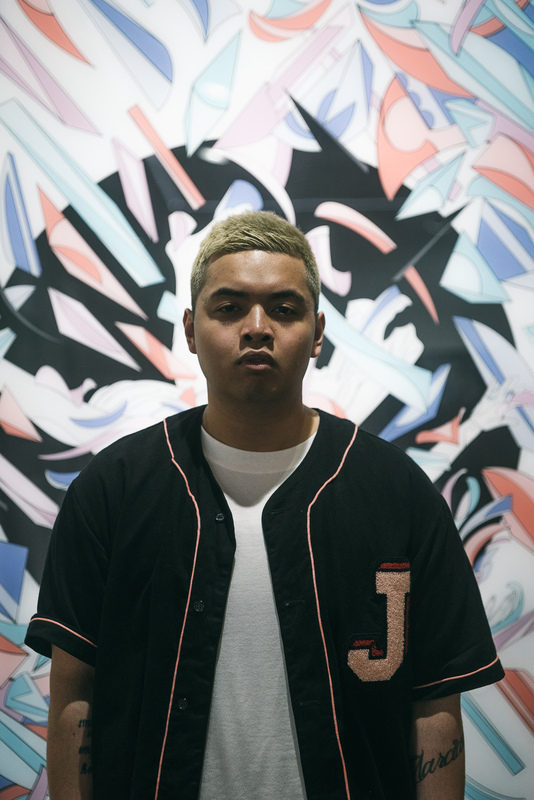 My name is Louis De Guzman, I’m a visual artist from Chicago, Illinois. You’re known for your geometric abstraction style of art. Your debut vinyl was the Bart Simpson-inspired sculpture Elevate. It was just me wanting to really kinda step outside my medium of digital and acrylic work, and do something that I can put more depth into. With my style and intricate detail, I tried to bring to life something just more tangible for other people to enjoy. Always wanted to do it so we just kinda put our hands together, my team and I–Austin Neely, Bradley Butchko, our guys Rich and Wally shout out to those dudes. We just kinda made a thing, you know. Being born and raised in Chicago, how did the city influence you and your art? Chicago is home, bro. It’s like, there’s a lot of great talent coming out of Chicago and it influenced me because it’s more of my story and my family. My parents basically came to Chicago from the Motherland looking for a better life. I was born and raised in Chicago and hearing their struggles just motivated me to step up and chase what I wanted to do. You’ve worked with a lot of other Chicago natives like Don C and Virgil Abloh. What was that like? Virgil and Don started a boutique called RSVP Gallery and I worked there from 2011-2017 as a graphic designer. Working with those guys helped me a lot. They had a very disciplined skill set that really stood out to me. Especially with Don. I lived in LA for a year-and-a-half, working with him directly at Just Don. He’s like my big brother and I learned so much from that dude. Can you tell us more about your role at Just Don? I was one of Don’s graphic designers and art directors. I handled mostly product designs. Were you the one who designed the NBA shorts collection? Yeah, I helped with the shorts; all of them. What was it like to see a product that you helped design worn by one of the most decorated athletes of all-time? It’s wild because you know, it’s Don’s product but he had me help him develop it; having him tap me for influence. We made sure everything was done properly right especially down to the graphics. It was really cool to be able to see Kanye, LeBron, wearing something we did in a small office that went worldwide. You’re a huge Chicago Bulls fan, too. Can you tell us about your recent work with the Bulls? At first, we made a New Year’s Eve party in which they tapped me to do an installation. And then I made good friends with the Bulls people and just kinda wanted to link up and do something. When they were looking for Chicago-based artists for collabs, they were like, “We have this artist Hatsters from Chicago and we were wondering if you wanted to do a hat”. I went into the meeting and they let me do what I wanted so I took my style and twisted it a little bit for a more nostalgic vibe and aesthetic. So you gotta be big on basketball. How does the game influence you? Man, it’s like, growing up in the Mike [Michael Jordan] era; having my family witness his moment was like really, ‘Yo, you gotta chase your dreams and fight for what you want’. With the Bulls winning all those championships back in the day made me really hyped up because even if I wasn’t as good as basketball, I remember drawing the Bulls logo as a kid and coming up with my own jersey designs on pencil. It was just for fun, but basketball just really pushed me to be out there, you know. Let’s talk about your exhibit here in Manila. In essence, what is ‘In Between The Lines’? ‘In Between The Lines’ is my first original body of work. When I say that, it means that it’s not pop culture related. I’m not copying or stealing anything, it’s completely original concepts. I’m veering away from what people know about my work and going in between the grey area and just kinda showing out what we can do. For myself as an artist, it’s like breaking through my comfort zone because a lot of my work was mostly black and white line work. So when I started using color, people started to notice and it just took off from there. What I wanted to bring to Manila is something original that has always stuck with me. You were born and raised in Chicago but proudly Filipino. How do you connect your heritage to your art? Man, it’s probably my upbringing. My mother’s dream was to do arts and crafts, coming from the Philippines. She just loved creating. She always took me to crafts shows when I was a kid. Filipino people, in general, are really creative. They got that finesse, in a good way. They’re able to figure things out and make them look cool. So the influence on me is that I took the resiliency of the Filipino people but as an American too, meshing it together to see what I can do. What’s next for Louis De Guzman? Man, we have a big year ahead. We’re doing ComplexCON in Chicago, teaming up with some of our guys back home. I’m really honored to be a part of it along with the amazing artists in Chicago. We also have a really, really big project coming which I can’t share yet but it’s gonna be…I could humbly say that you’ll be very surprised and not expect it. To see what is right without acting on it bespeaks an absence of courage. For Louis, the right thing was the only thing to do–and that speaks courage. Dream big and step up. “In Between The Lines” by Louis De Guzman runs from March 31 – April 11, 2019 at the Secret Fresh Gallery in Ronac Art Center, San Juan. Follow CLAVEL on Facebook and Instagram.